MUJI and Sensible 4 have combined their expertise to create an elegant robotbus, first in the world to function in all weather conditions. For this shuttle Sensible 4 provides the autonomous driving technology which ensures the vehicle with superior positioning, navigation and obstacle detection performance thus allowing autonomous driving throughout the year regardless of the environment and conditions. While MUJI provides the vehicle its famous design and user experience. The vehicle will be displayed to public in its premiere March 2019 in Helsinki. After launch, the Gacha shuttle bus will be driving and taking passengers in three Finnish cities as part of real-life traffic (also be seen MUJI store, opens Nov 2019 in Helsinki). Sensible 4 and MUJI are finalizing plans for first Gacha fleet which is expected to roll out in 2020. The aim of the collaboration is to develop autonomous shuttle bus fleets for mainstream use and to provide real transportation services for the public already in 2021. Currently, Sensible 4 is looking for suitable industry partners whom would be interested in producing the buses as well as investors to accelerate the company growth. Weather plays a critical role in opening the market for autonomous buses or robotaxis. Currently heavy rain, fog or snow are preventing autonomous vehicles from driving as the existing technologies are mostly being tested and developed in warm climate conditions. Meanwhile Sensible 4 has focused in technology test and validation under the arctic Lapland conditions giving the company a unique advantage over the other self-driving technologies. Naturally all autonomous vehicles need to be able to drive in various weather conditions, before they can be commercially deployed. "We are developing these vehicles so that they can become part of daily transportation service chain. Autonomous vehicles can't become mainstream until their technology has been insured to work in all climates", says Harri Santamala, CEO of Sensible 4. Sensible 4 delivers systems to autonomous vehicles and aims on collaboration with the leading automotive OEMs and their suppliers. Sensible 4 software can be integrated in to any autonomous vehicle platform from small cars to full -size buses. Currently, Sensible 4 offers free open-to-all rides as part of pilot in southern Finland in Espoo, the home city of the company. Results are clear: it works everywhere! MUJI proposes a pleasant life. This not only covers products for daily life but also the challenges faced by different communities. The advanced technology of autonomous driving has potential in the countryside where decreasing birth rates and aging populations are causing problems in these communities. 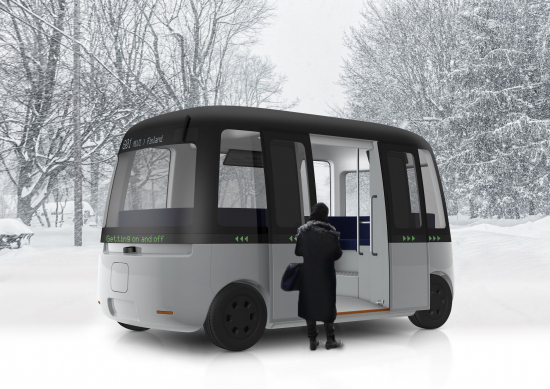 The Gacha autonomous shuttle bus is an all-weather concept that can be shared among the community. This paralleled MUJI’s philosophy and thus the collaboration with Sensible 4 started in 2017. The design is made in consideration of the users. The highlights of the design are its shape, which is friendly and designed with no front or back, the LED light belt, which is made from the combination of the headlights and communication screen, and the seating that follows the soft rounded square shape of the bus. Sensor package: 4 Lidars, 8 radars, 360 deg camera vision, high precision GPS, inertia unit, control over 4GLTE/5G.